The scientific mind not only analyses and dissects; it can also glimpse something that surpasses the limitations of the individual cognitive field. Thus while Jung could conceive the collective unconscious and modern physicists now recognize that subatomic particles like leptons and quarks cannot be subdivided any further because they lapse into formlessness and thereby come closer to the formless ether much like the Brahman of the Upanishads, still there is a gulf of difference between what the scientist conceives as the beyond-mind and what the mystic realizes as the Absolute. Sri Aurobindo explains the mind can have some vague idea of the formless ether but cannot grasp the fountainhead of infinity with conviction and certitude. ‘For if Mind appears sometimes to conceive, to perceive, to sense or to enjoy with possession the infinite, it is only in seeming and always in a figure of the infinite. What it does thus vaguely possess is simply a formless Vast and not the real spaceless infinite’ (The Life Divine, pg 176). 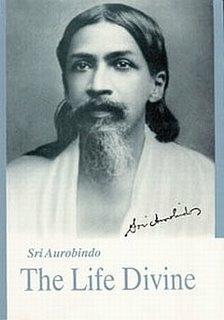 Sri Aurobindo reiterates that the inability to grasp the infinite is not a drawback of the mind because its business was not to possess that ability but to display ‘the inalienable tendency to delimitation’ (Ibid) so that it can handle images, forms and words. If the indivisible was the only reality, there would not have been a world of variability, divisibility and uniqueness. Actually what the Mind does is a great service to the cause of creation. It does its work in consonance with a divine fiat as an instrument of the supreme Maya which has the onerous, mysterious and magical task of manifesting the finite from the Infinite, a supremely illogical, absolutely incomprehensible yet incredible and inevitable necessity. As an office of the complete instrumentation of the Supreme Maya, the task of the mind is to always translate ‘infinity into the terms of the finite, to measure off, limit, depiece’ (Ibid, pg 176). A pertinent question can be raised that if the body can transcend its limits, if a trekker can climb to the Himalayan peaks or if the Hath yogi can practice levitation against gravity, why would it be impossible for the mind to grasp the fountain-head of infinity. That is actually impossible as for the mind, the corresponding Himalayan peak to be ascended is actually the domain of the Supermind. ‘Mind cannot possess the infinite, it can only suffer it or be possessed by it; it can only lie blissfully helpless under the luminous shadow of the Real cast down on it from planes of existence beyond its reach. The possession of the infinite cannot come except by an ascent to those supramental planes, nor the knowledge of it except by an inert submission of Mind to the descending messages of the Truth-Conscious Reality’ (Ibid).